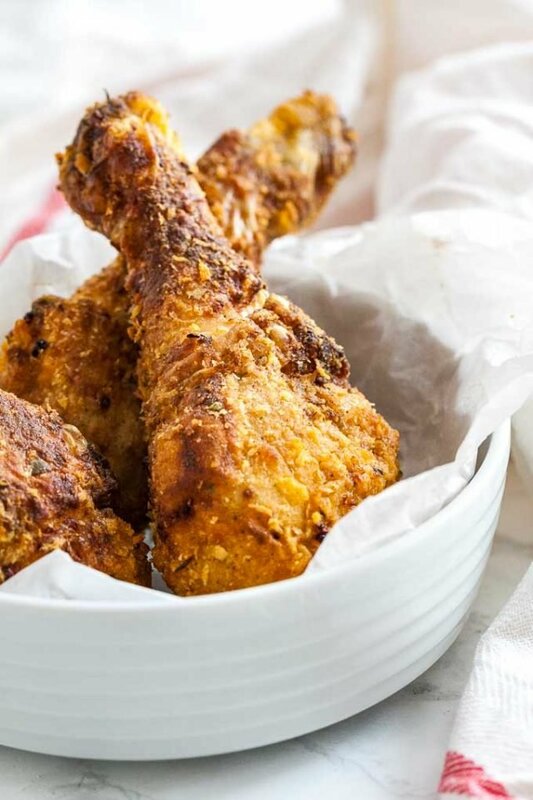 Juicy AirFryer Chicken Drumsticks – made with only 3 Tbsp butter but full of flavor and really easy to make. They’re tender and juicy inside and crispy on the outside. You have to try them! These air fryer fried chicken thighs are crispy on the outside and so juicy and tender on the inside! They taste like real fried chicken but are made using a healthier method with much less fat. Perfect for every fried chicken lover who whats to eat a bit healthier without losing flavor! My husband loves fried chicken, especially the one from a chain with three letters. You know what I mean! I love it too but since we’re trying to eat healthier I experimented a bit with our new AirFryer and came up with this delicious recipe. It tastes so good you won’t believe it’s made with much less fat! 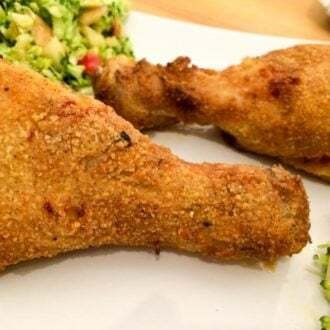 My husband loves this air fried chicken recipe!
) is one of the most used appliances in our kitchen! It gets hot much quicker than the oven and it makes fries taste so much better than making them in the oven. Just put the fries in the basket, shake it every 5 minutes or so and you get delicious crispy fries. An air fryer is a small kitchen appliance that cooks food by circulating hot air around it with a mechanical fan at high speed, cooking the food and producing a crispy texture similar to frying, but without all the oil. It cooks food with 70% to 80% less oil than a traditional deep-fryer. The Air Fryer is perfect for making small things like fries, fish fingers, or frozen chicken strips in it. You could even make a whole roast in it but I haven’t tried that yet. You can preheat the AirFryer but I often don’t do that, it gets hot so quickly, so I don’t think it’s necessary. To clean it, I just put the basket which holds the food in the dishwasher or I clean it quickly with some hot water and pat it dry with kitchen towels. It’s really easy and quick! The basket is big enough for fries for 2-3 people, so if you are more you might need to do it twice but thin fries only take about 10 minutes. 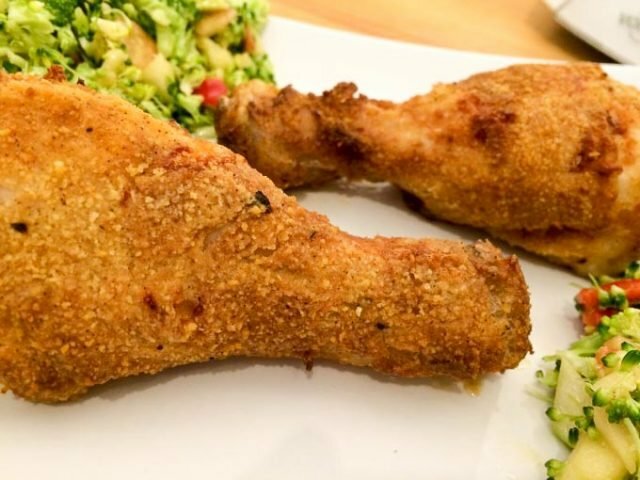 These air fried chicken legs are made with buttermilk and have a crispy and slightly spicy breadcrumb crust. They are so juicy and tender inside and make a great dinner or party snack. We often have them with Creamy Crock Pot Mashed Potatoes and homemade coleslaw. 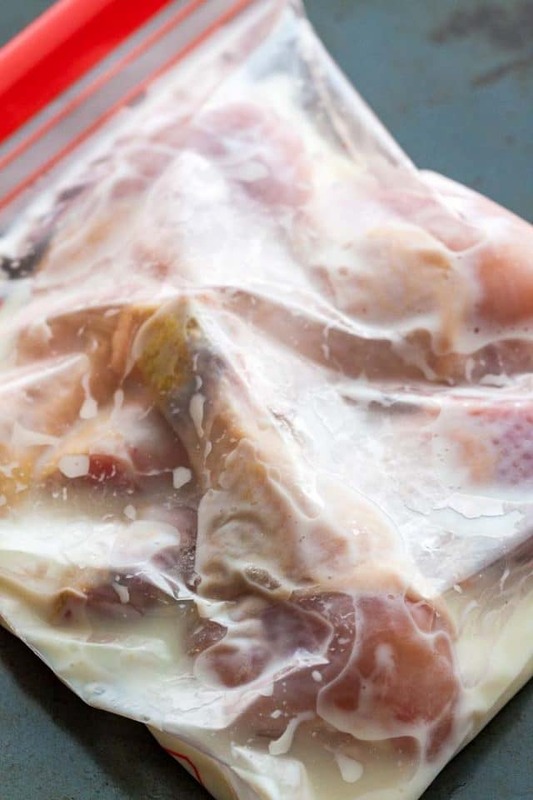 Put chicken with buttermilk in a ziplock bag and refrigerate for 30 minutes. Combine spices and breadcrumbs in a bowl. Dip chicken pieces in the breadcrumb mixture. Put the chicken pieces in a single layer in the air fryer (don’t overcrowd the basket) and fry for 20 minutes. Brush with butter after 10 minutes. Looking for more healthier dinner ideas? This is the model I use and love! It has a big enough basket for a family of 3 or four and is easy to use. Panko Breadcrumbs work best for this recipe. Place the chicken drumsticks with the skin on in a plastic bag and pour the buttermilk into the bag. Squeeze the air out and seal the bag. Let marinate in the refrigerator for 30 minutes minimum up to several hours. 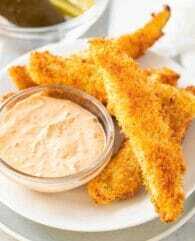 In a shallow bowl combine the panko breadcrumbs, flour, baking powder, and spices. Preheat AirFryer to 390°F (200°C) (or don't preheat it and just fry the chicken 2 minutes longer). 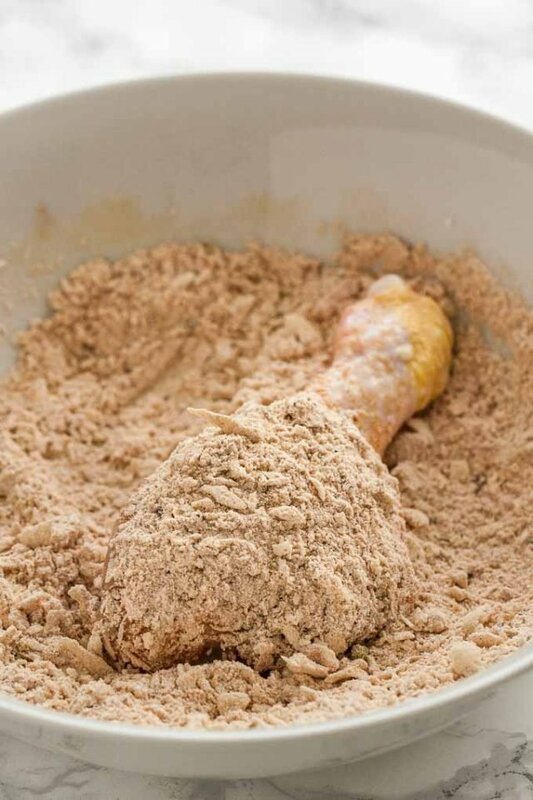 Remove the chicken from the buttermilk, shake off excess buttermilk, and dredge the drumsticks in the seasoned flour mixture to coat on all sides. The pause the AirFryer and brush drumsticks with melted butter on both sides. Turn the chicken over, lower the temperature to 300°F (150°C) and air fry for 10 more minutes or until internal temperature reads 165°F (79°C). 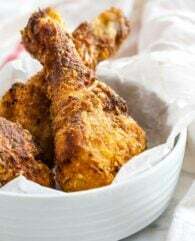 Remove from Airfryer and let the drumsticks rest for 5 minutes before serving. This recipe also works for chicken tenders, the only difference is the cooking time. Follow the recipe above using chicken tenders instead. 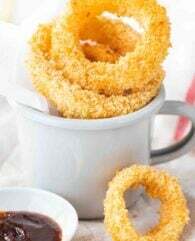 Place them into the basket of your airfryer. Cook for 14 minutes at 400 degrees. Flip the tenders after 7 minutes. Using an Air fryer to make chicken wings gives them a crisp texture without using any oil. Place about 1 lb. chicken wings in the fry basket. Cook for 25-30 minutes at 360°F until the skin is browned and crisp. Flip the wings every 10 minutes while cooking. Transfer them to a bowl and toss them with 2 Tbsp of your favorite wing sauce. We have just gotten out air fryer. Tried your recipe and the wife and I loved it. Thank you for sharing. Thank you for sharing your recipe !! I am posting this comment only because of people saying that their food didn’t cook through fully. Because of health issues, chicken in my air fryer has become my most-often-cooked meat entree. I always try to buy medium-to-large size pieces because we eat only meat and veggies — no side dishes. I usually cook either 4 chicken thighs or 6 legs for the two of us and have found that 20-25 minutes @380 degrees works best for both, flipping them over midway cooking time. I start checking for doneness at 20-minutes. Both legs AND thighs come out cooked thoroughly and crispy, yet still nice and juicy. Huge hit with my husband! Thanks for the great recipe! I just made the recipe and it turned out crispy on the outside but red on the inside. I don’t think the air fryer temperature should go down to 300. Cooking time might be a bit longer (or shorter) depending on your Air Fryer and how big the drumsticks are. I recommend using an Instant Read Thermometer to make sure meat is fully cooked, this really helps with getting it perfect – done but not dried out. If you don’t have one cut into it and if the juices don’t run clear put the drumsticks back in the Air Fryer and cook for a few minutes longer. I thought it tasted good but my chicken was NOT done. It registered over 160 (closer to 180 on some) but was still pink and bloody in the middle. Anyone else had that issue? Ive got bread crumbs but no flour.. Do I have to have the flour. I have baking powder, soda and cornstarch?? Can I use regular bread crumbs instead of panko? Yes, you can use regular bread crumbs. Absolutely delicious! All of my kids finished dinner tonight. This was my first time using the air fryer for chicken, glad I found this recipe! Thank you!!! Can’t wait to try the air fryer wings recipe. 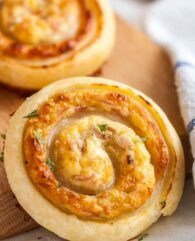 Made this recipe many times and it is great. Has anyone made it with chicken wings? How long did you cook it? So happy you like it, Jackie! 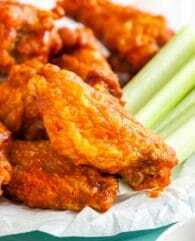 Have you tried my Air Fryer Chicken Wings recipe? I would not recommend using an egg. I haven’t tried this myself but I found a dairy-free alternative on an allergy website: Use your favorite non-dairy milk (1/2 cup) and combine it with 2 tsp lemon juice or vinegar. Let it sit for 10 minutes and then use as a replacement for the buttermilk. Hope this helps! Haven’t tried my air fryer yesterday just got but have to have heart healthy and low carb recipes. Just received my air fryer.. Would love to have more recipies and will be trying the chicken drumsticks this weekend. 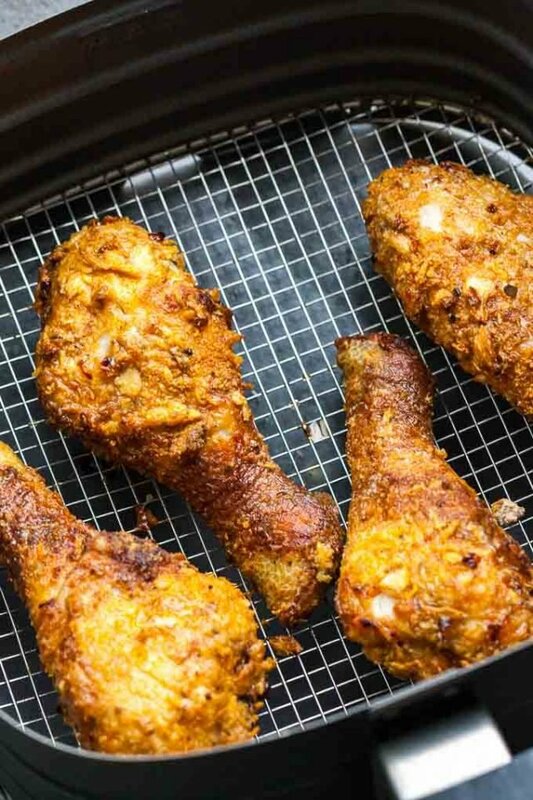 I love my Go USA air fryer and i appreciate the great recipe info but I am doing the MFP and need to get nutritional info on two drumsticks such as calories, fat and carbs in order to make my entry. Can u help me? I replace breadcrumbs with pork rind crumbs (using food processor), it’s delicious for anything you want to bread and zero carbs! Do you have to use butter milk ? Yes, for the best result I recommend to use buttermilk. You can also make your own! 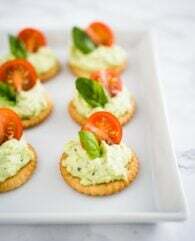 I have this recipe on my favorites list. Gonna make it tonight. Simply Delicious. Can you use flour on the chicken for more of a fried chicken taste? I recommend using a mixture of flour and panko breadcrumbs for the best taste! Happy happy I ran across this recipe. Best ever. I am using behave air fryer. First time my cuisinart air fryer. Righto, I’m off to the supermarket tomorrow – I’ll let you know how I get on ? Pickle juice. Both me and chick fila swear by it. Instead of buttermilk, I use whole milk and add white vinegar. You will earn the best ratio by practice. The vinegar works with the whole milk to produce a very similar non-buttermilk alternative! The chicken was awesome! I wouldn’t be able to tell the difference from the fried in oil version from this. I love my fried chicken even more now because I don’t feel guilty about the fat!!! Also, it was so easy to make. ? The chicken I made was easy and fabulous…then made french in my air fryer (Nuwave Brio 6 qt.) But I can’t stand the smell in my house ! I am hoping it’s because it’s new… it’s a burning plastic smell. I tried the air fryer because 1. My daughter loves hers and 2. I didn’t like the smell in my house after using my deep fryer…so I am no further ahead. Has anyone else have this problem and does it go away? I got the 10 qt and first few times i used mine it smelled too. But it did go away after several uses. I love my nuwave! 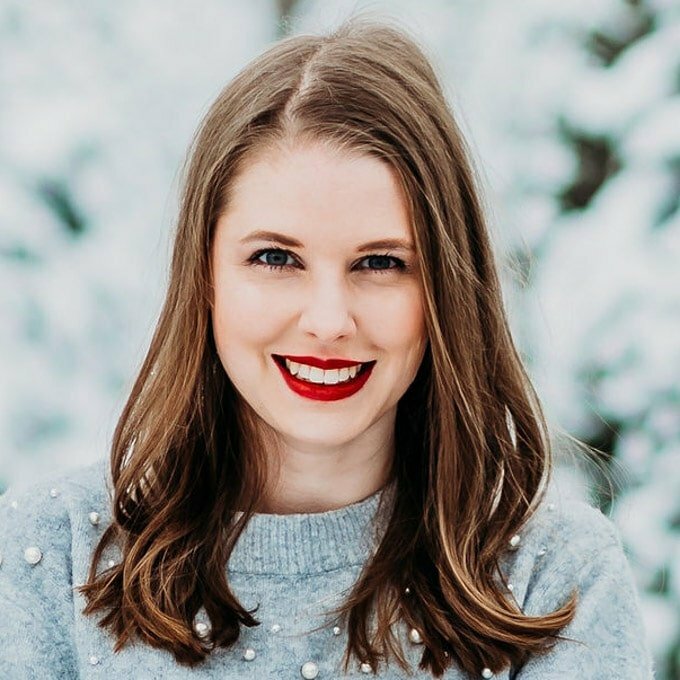 Ive been on the fence about an air fryer, which is conveniently still sitting in the closet…. I m kind of loving how you mention how easy they are to clean … Going to have to hop off and give it a whirl now!